Several leading Russian enterprises presented their latest products at the recent international woodworking industry exhibition Dubai WoodShow 2018, held in Dubai, UAE. A joint stand, organised by Russian Export Center, was visited by more than a thousand participants and guests from three dozen countries, said a statement. 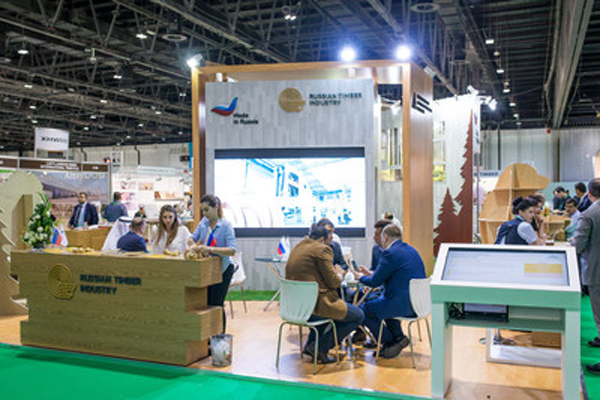 Participation in the exhibition was aimed at promoting Russian timber construction materials in the international market, developing the export potential of Russia, the priority of which is to increase the share of non-resource exports, it said. Victor Evtukhov, state secretary - Deputy Minister of Industry and Trade of the Russian Federation, said: “The products of the Russian timber industry are of high quality, thanks to which they compete with the best world standards on equal terms." In 2017, the volume of exports of the Russian timber industry amounted to RUB673 billion ($11.71 billion), which is RUB19 billion ($330.6 million) more than for the previous year. We aim to continue work to develop the export potential of the timber industry, he added. To discuss the prospects of the investment potential and export of Russian products of the timber industry complex, representatives of Russian enterprises met with Mohammed Hamdan al-Zaabi, director of the Trade Promotion and Investment Department at the Ministry of Economy of the UAE. The representative of the UAE stated about the interest they have in cooperation with Russia; the parties planned a joint round table on investments and visit of partners to Russian enterprises for detailed study of products lines. Russian companies presented the latest samples of plywood, chipboard, OSB and MDF, glued and LVL-beams, wall panels, furniture panels and components, and sawmill products. Interest in the Russian line of modern wood processing products is high - the enterprises held more than one hundred and fifty negotiations. An agreement was reached on the supply of flooring for the scaffolding to Kuwait by Modern Iumber Technology (Utralam) to the amount of $500,000; preliminary applications were received for the products of other Russian exhibitors.